Mini Rotary Tablet Press Manufacturer In India: We are the largest making “Mini RotaryTablet Press” Manufacturers from India.we are considered as the leading manufacturer and exporter of Mini Rotary Tablet Press. These Mini RotaryTablet Press are provided with maximum and minimum speed of the turret, which is achieved with the AC variable drive. Our offered Mini RotaryTablet Press are developed using superlative quality of raw materials that are procured from the authentic vendors of the market. These Mini Rotary Tablet Press are quality tested with the aid of our diligent analysts and then provided at the customers' place within the stipulated time frame. DESCRIPTION Of Mini Rotary Tablet Press : This rotary tablet press is built as per the GMP directives with total robust construction. At the same time, the necessary care has been taken to have trouble free operation, easy to clean and very low noise level. This state-of-the-art equipment can also be used for small batch production, thanks to its ‘B’ tooling specifications like 6 Tons pressure, maximum tablet diameter 16mm etc. which can be utilized for achieving the better output in its range. The maximum/minimum speed of the turret is achieved with the AC variable drive. Also the turret is equipped with key ways in upper guides as a standard feature. This small wonder is totally mobile and can be placed easily on table for laboratory use. As an additional precaution lower punch is equipped with seal(optional). A fixed feed frame ensures easy settings and lowest wastage of material. 2. SALIENT FEATURES Of Mini Rotary Tablet Press : 1. Easy Movability. 1. Easy to Operate & Clean. 2. Hard Heat Treated Rollers. 3. AC drive with Fixed Pulley. 4. Turret with key ways in Upper guides. 5. Open fixed Feed Frame. 6. Drive from Center Pillar by worm reduction Gear Box. 7. Built as per GMP directive. 8. Fabricated Pressure Roller Carriers. 10.Turret fitted Thrust Bearing. 11.One piece Upper Cam Plate / Track. MANUFACTURER OF DOUBLE LAYER TABLET PRESS IN INDIA. We are the largest making “Double Layer Tablet Press Machine” Manufacturers from India. 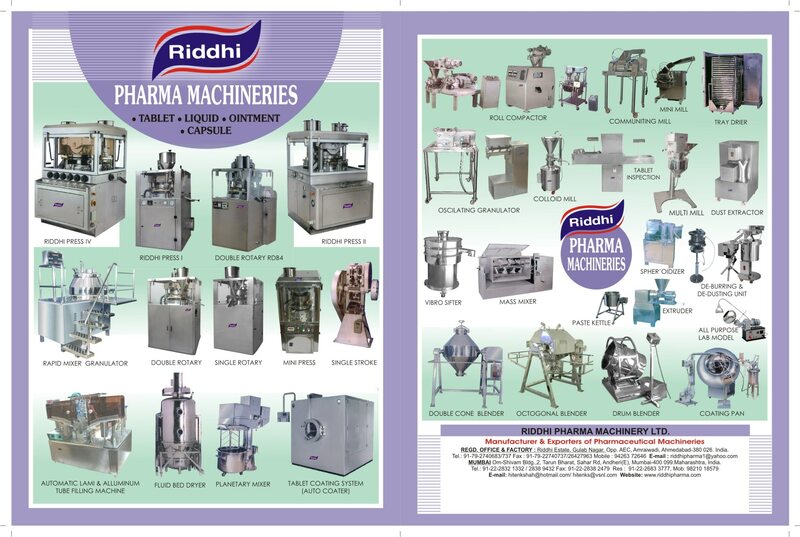 Double Layer Tablet Press Machine are an essential component of manufacturing oral solid dosage formulations. This Double Layer Tablet Press Machine support precision manufacturing and provide highly uniform results while minimizing dependency on operator skill. All Double Layer Tablet Press Machine are fully compliant with pharmaceutical documentation. We offers power-packed, yet precise Double Layer Tablet Press Machine tooling for its high-speed tableting machines. "Manufacturer" Of Tablet Compression Machine In India. We are the largest making “Tablet Compression Machine” Manufacturers from India. Tablet Compression Machine are an essential component of manufacturing oral solid dosage formulations. This Tablet Compression Machine support precision manufacturing and provide highly uniform results while minimizing dependency on operator skill. All Tablet Compression Machine are fully compliant with pharmaceutical documentation. We offers power-packed, yet precise Tablet Compression Machine tooling for its high-speed tableting machines. Tablet Compression Machine Manufacturer In India: We are the largest making “Tablet Compression Machine” Manufacturers from India. Tablet Compression Machine are an essential component of manufacturing oral solid dosage formulations. This Tablet Compression Machine support precision manufacturing and provide highly uniform results while minimizing dependency on operator skill. All Tablet Compression Machine are fully compliant with pharmaceutical documentation. We offers power-packed, yet precise Tablet Compression Machine tooling for its high-speed tableting machines.